Prefect for those hot sunny days or a quick easy dessert. Place the strawberries, sugar and Grand Marnier into a heavy based saucepan and simmer until the sugar is dissolved completely. Set aside to cool, then puree and place in the refrigerator until cold. 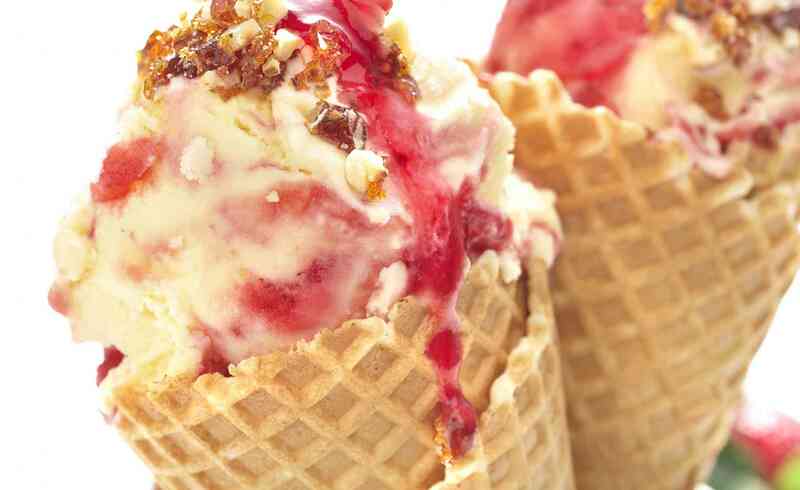 Remove the icecream from the punnet, soften slightly and fold in half of the chilled strawberry puree. Refreeze until firm. While waiting, place chopped hazelnuts in a small heavy based pan with extra sugar, allow sugar to dissolve completely and cool slightly. Pour onto a lined baking tray and allow to set hard, then crack into shards. To serve, place some extra chilled puree in the base of a tall sundae glass. Top with fresh strawberries, then a big scoop of the Strawberry Ripple icecream. Top with more fresh berries, then another scoop of icecream and sprinkle with hazelnut praline. Serve immediately.